Do we need to reconsider scientific methodology in light of modern physics? Has the traditional scientific method become outdated, does it need to be defended against dangerous incursions, or has it always been different from what the canonical view suggests? To what extent should we accept non-empirical strategies for scientific theory assessment? Many core aspects of contemporary fundamental physics are far from empirically well-confirmed. There is controversy on the epistemic status of the corresponding theories, in particular cosmic inflation, the multiverse, and string theory. This collection of essays is based on the high profile workshop 'Why Trust a Theory?' 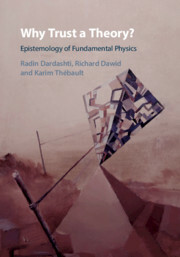 and provides interdisciplinary perspectives on empirical testing in fundamental physics from leading physicists, philosophers and historians of science. Integrating different contemporary and historical positions, it will be of interest to philosophers of science and physicists, as well as anyone interested in the foundations of contemporary science. For more details on the book, see the publisher's website. For more publications by Karim Thebault, see his website.